Many companies aspire to build brands that eventually get etched in the culture of the society and become cultural icons, but very few are able to achieve iconic status. Iconicity does not happen by chance, but rather has to be carefully planned and executed. If the ultimate benefit of branding enhances shareholder value, boardroom leadership has to take charge of the brand ideals from the top of the pyramid and enable it to drive a shared vision throughout the organization. This requires a balancing act between long-term perspective and short-term performance – often a difficult task, especially for publicly traded companies. Identity myths and storytelling are keys to building iconic brands, but stories cannot substitute for great products and services. The strongest brands are first rooted in product and service performance. In all categories, a minimum standard of quality is necessary to even compete. Second, these quality products and services are differentiated in a way that can help defend their market positions – often with innovation as an integrated component of their company culture. Third, they have all been running profitable and very well-driven operations that allow them to stick to a long-term plan and not deviate when times get tough. 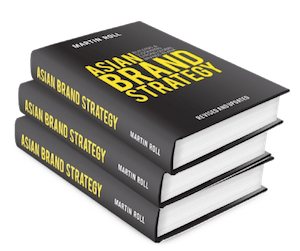 Assuming, then, that you have these pre-requisite strengths of product quality, differentiation and operations to become a competitive brand in the long-term, there is one final element remaining in order to elevate the brand become truly iconic. This final dimension is a strong emotional connection. A look at some of the most iconic brands in history such as Coca-Cola, Harley Davidson, Giorgio Armani, Apple, Chanel, IBM, Giorgio Armani, L’Oreal, Louis Vuitton, Sony, Amanresorts and Singapore Airlines reveals some very common characteristics. All these brands have been able to build and sustain strong emotional bonds with their customers and stakeholders that are far greater than their strengths in quality management, innovation and operations could achieve on their own. These brands have created an enduring mythology about themselves. They have mastered the art of storytelling and passed the responsibility of sharing that story to their brand communities who do it for them. For any brand to attain iconic status, it has to create an identity myth. Brands that resonate and show direction to the masses through brand stories and brand activities become inscribed in our culture. These brands, by creating an identity for themselves, provide identity to members of society. Brands in today’s world are not inanimate “things” but thriving entities with identities and personalities that allow customers to express themselves through consumption. As such, to attract customers and make them actively participate in varied branding activities, brands should have a strong story that customers can easily identify and relate to. Such a story would not only provide authenticity to the brand but allow customers to express their own unique sense of self through their purchase or association. Psychological research demonstrates that brands are durable because people are cognitive misers. Our modern society is overloaded with information, and the average person receives far more information than one can possibly digest properly. Therefore, people seek to simplify the world by relying on a variety of heuristics to minimize the amount of information processing needed to make reasonable decisions. There is far more noise than signal in today’s multimedia world to expect a customer’s full attention at all times. Audiences need something more enduring and unique than product features to grasp on to. Humans are wired for narratives. We intuitively search for patters where none exist and make up stories in order to make sense of the world around us. We are naturally sceptical of sales pitches and being instructed or told to do things, but we let down our guard for stories because they are less intrusive and can capture our imagination. Although they can be effective in the short term, the marketer’s tools of promotion and price discounting does little to create true loyalty. Furthermore, they can be easily copied by competitors, creating a downward spiral of discounting and bundling that distract from whether a brand has a truly authentic narrative. Humans are creatures of evolution and storytelling is at the centre of how we share ideas that matter and build relationships for survival. Great brand stories that resonate with consumers and touch their lives in some way can be defined by a single word such as freedom (Harley-Davidson), power (BMW), design (Apple), elegance (Dior), imagination (Lego), beauty (Estee Lauder) or safety (Volvo). These brand stories offer consumers a good reason to elevate the brand beyond a mere utilitarian role in the market. While logic opens the mind, emotions open the wallet. When multiple elements of a brand such as images, stories and associations leverage deeper meanings or shared values, sociological research demonstrates that people are less likely to switch brands. Because these elements are shared collectively by groups and networks of people, they form generally accepted conventions about the brand. It is difficult for individuals to abandon shared conventions and, therefore, more difficult to switch brands. Marketing should no longer be about persuasion, but connection with the past, present or future. A compelling brand story begins with the brand’s purpose. To build an iconic brand, a company’s purpose must be a clear transcendent idea – something that aspires to be more than simply a competitor in a particular market, gain market share or become “the chosen provider of” an item. Vision and mission are the cornerstones of brand and boardroom strategy. The vision gives the brand a reason for being while the mission provides it with strategic objectives. A company’s first priority should be a clear point of view on what an organisation’s sustainable competitive advantage should be about. There is no competitive advantage in doing what others have done before. To create a meaningful proposition, senior leadership must first understand each of their stakeholders and decide the priority each audience should be given. Stakeholders include more than just customers, but employees, investors, partners and suppliers – even the citizens of a country where a brand bases its operations. Prioritization, unfortunately, is where many brands fail from the start. While they may pay lip service to their consumers as the force which drives every action of the company, many executives place a higher priority on the price of the company’s stock. Today’s best brands have wrapped the goals and vision of their company around the needs, values and emotions of their customers. They are in touch with their humanity and evoke emotions that are tied to both conscious or unconscious needs and desires. This does not mean executives shouldn’t care at all about shareholder value – they absolutely should. But those who manage sustainably iconic brands understand that financial performance must be driven, first and foremost, by a greater concern for those who buy their products than those who buy their shares. Iconic brands must have a higher purpose – a promise to create a better world somehow. Assuming a company gets its vision and mission right, how does it become a story? The answer: People. Like any traditional story, characters and heroes must interact with their setting in pursuit of a big idea or challenge that drives the plot. It is with people that a brands’ story must begin. The brand perception, after all, is created out of thousands of experiences with products, services and systems created by people. Great storytelling outside the company starts with inspiring storytelling internally. Rarely can a brand’s mythology be arbitrarily imposed on employees by marketers. Instead, it should come from meaningful stories from the brand’s history that make it authentic. It should begin with honest, sincere stories people tell within the organization. Whether the company is known by their surname or not, so many brands have become synonymous with their famous and legendary founders or key leaders who would not compromise when it came to their personal vision driven by human need. Think of what Steve Jobs, Estee Lauder, Coco Chanel and Walt Disney did for their respective brands and the tremendous value that Ralph Lauren, Giorgio Armani, Howard Schultz, Jeff Bezos, Michael Bloomberg and Jack Ma creates for their brands? Just to name a few leaders who drive significant value to their brands. Brands must carefully nurture the culture that perpetuates its brand story. Rewards, process, strategy and structure must effectively support culture. Employees must understand the company’s mission, vision, values and brand promise. They need to know in detail, who the target customers are, what they expect, their needs, desires and, most importantly, how their own role in the organisation contributes to delivering the differentiated customer experiences that are so sought after today. Organisations should be looking for people who are independently driven to want to do the best thing for customers. Once they are on board, training systems are needed to reinforce and influence behaviours over time. Only by more closely aligning the hiring processes, compensation systems, training, recognition and measurement schemes by tying them directly to the brand proposition and ideal culture can companies expect to provide an experience true to a brand’s mythology. The message itself is the start, but you cannot forget about the messengers. It is no coincidence that some brands get more word of mouth than others. Dissemination of the brand story is critical for an iconic brand. You can have a great product or service, but without people to perpetuate the mythology on their own, the effectiveness of marketing activities will plateau. The four major authors of brand stories are companies, culture industries, intermediaries and customers. Each of these authors facilitates the brand to blend into the fabric of society. To give the brand scale and keep messages consistent, brands have to make sure they are speaking to their influencers. Above all types of influencers, consumers are the most powerful force in marketing. Today, more than half of brand communication is peer-to-peer thanks to the digital revolution and explosion of social media. When considering products, today’s consumers read online reviews, visit stores, and then search for deals and competing offers while in-store anyway. In fact, a majority of millennials believe it is their duty to other consumers to rate, review and share information about the brands they buy after the purchase. Social word of mouth has been shown to increase marketing effectiveness up to 54%, and 65% of internet users use social media. Even on occasions where brands aren’t being specifically talked about, they are being recorded, photographed, shared, linked and “liked”. So companies need to arm potential influencers with more than just words and phrases, but experiences and images people will feel passionate enough to capture and send – moments that will speak for themselves without the need for words. The objective and most important result of developing an iconic brand is not just the sharing, but the growth and strength of brand communities. A brand community is a group of loyal brand customers who are bound together by their loyalty for the brand and what it offers them. They are largely imagined communities that represent a form of human association within a consumption context. Such a group is different from other consumer groups in that a brand community shares not only loyalty towards the brand but shared rituals and a sense of moral responsibility to one another to improve their experience. There is an intrinsic connection between members and a collective sense of difference from those outside the community. Brand communities are liberated from geography, commercial in nature, possess communal self awareness and are committed to the survival of the brand. A fundamental benefit for the brand is that communities offer real time feedback, allowing companies to co-create value with them on a continuous basis. Such an environment allows customers to experience the brand in a memorable manner as they are part of the value creation process. When people believe a brand is worth buying for reason far greater than its product, price, place or promotion, but because of a transcendent narrative that resonates with a consumer’s core values, businesses have the foundational element of an iconic brand. Iconicity begins with a mission founded on the true spirit or history of the company, requires product and service performance and profitability, but is ultimately defined by a strong emotional that allows allow customers to express their own unique sense of self through their purchase. Companies whose brands eventually become woven in to the cultural fabric of society and become enduring cultural icons have mastered the art of storytelling and nurture communities who perpetuate and contribute to their tale. For a brand to attain iconic status, it has to create an identity myth driven, first and foremost, by the highest concern for the emotional needs of those who buy their products or services.